Can you make a Painting for Me? Of course! Email » the artist to get a quote. We accept all payment methods. If you don’t see your preferred payment method in the invoice, please let us know. How can I Track My Prints? We will email you a tracking number that you may use to keep track of your shipment. What is your Delivery Method? Will my prints reach safely? Your prints are delivered in a rock-hard tube or box to ensure they reach your hands safely. What is the Delivery Date? Delivery normally takes about 2-3 weeks. Are you going to do XYZ painting? If it’s a well known person then chances are that the artist will get to them, eventually. If you don’t see a painting/person you are looking for, make sure it’s not already in the Works in Progress » or Speed Paintings ». If you still can’t find it or you are not sure, simply suggest it in the Feedback ». Remember, suggesting a painting/subject is definitely a way to get the artist’s attention to that particular painting/subject, and it increases the chances of its release. Are these Hand-Made? What medium are you using for these paintings? Yes these are handmade, and painted digitally just like one would on canvas or paper. Essentially, traditional painting techniques are applied on the computer, using softwares that mimic paintbrushes and papers. You can watch each step of how Bhagat creates his masterpieces here Bhagat’s Painting Process ». Where can I see more information about your products? We are so sure you will love our prints that we allow for up to 30 days for returns. How do you handle Stolen or Damaged Prints? We replace stolen or damaged prints immediately, free of charge. If you find that your package is missing contents or they are damaged, simply “refuse to accept” them when delivered. Our fine art printers will ship out a new print to you, right away. My question is about something else, what should I do? Email » the artist or use the form below and ask the artist. This page awaits your question(s). 1. A good artist uses references and uses them well. I use Mughal/ Sikh army references, armour refereces, horse references, human references, clouds references… you name it and I use it! 2. Block out the chunks in your image and then refine all the elements (composition, rhythm ,etc). Don’t focus on itty bitty details, rather work the whole image! 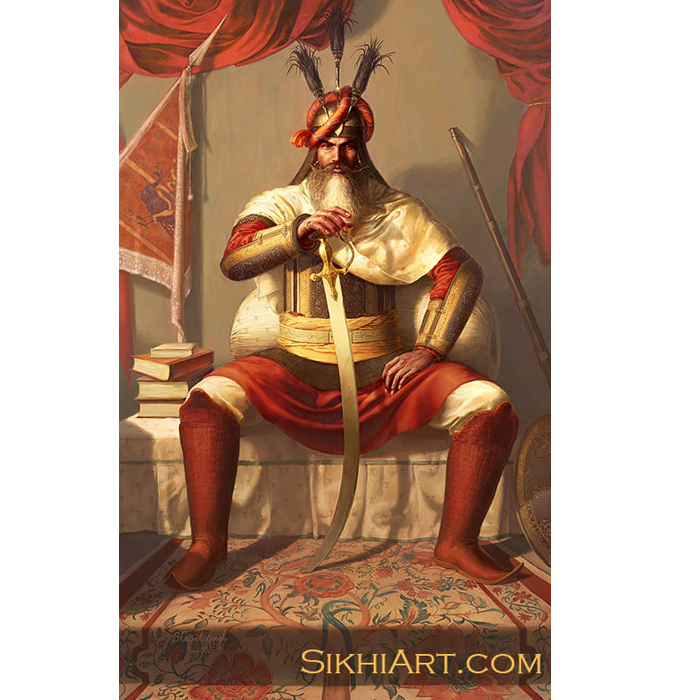 Can u paint portrait of Baba Deep Singh ji with shield & sword? Is it possible to buy the Hari Singh Nalwa sketch? Its a really good composition. 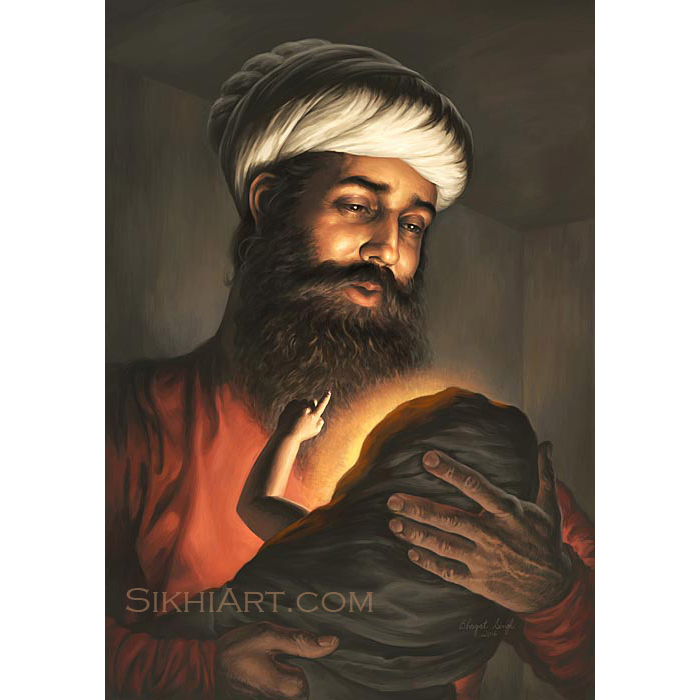 Any plans to do a painting of the Sri Guru Hargobind, tiger story? i saw all ur paintings,they are fabulous ……. as from my childhood i saw paintings by diffrent good artists,but they mostly based on same themes,..
are u going to pain Maharaja Ranjit Singh….? Thanks Jaggi, I am planning on doing one actually. It just won’t be any time soon. I plan to work on Guru Amardas ji, Hari Singh Nalwa and Banda Singh Bahadur next; people have been urging me to finish those off already. 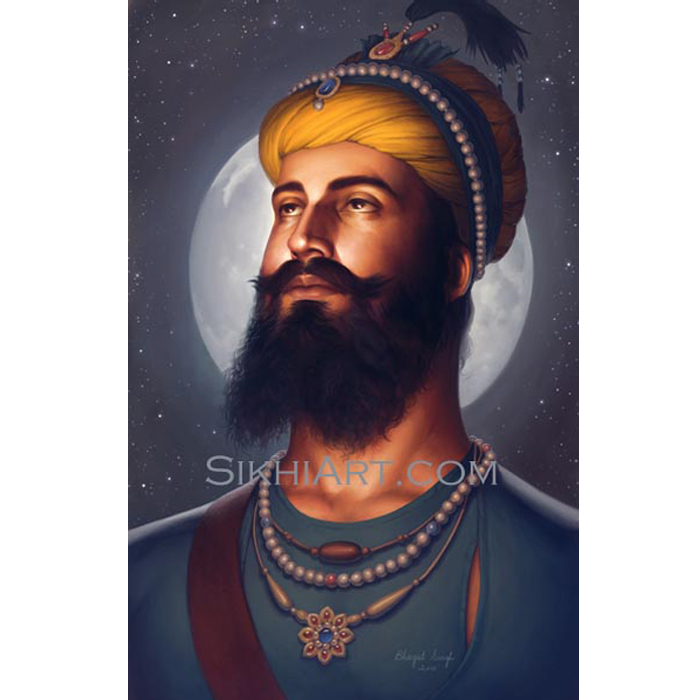 Amrit Pal asked if I will work on Sahibzada Jujhar Singh on the feedback page. I had started already. In fact, it is a really old sketch, and not upto my standards anymore so I will have to update it before, it shows up on my website. It is available only on my blog right now. 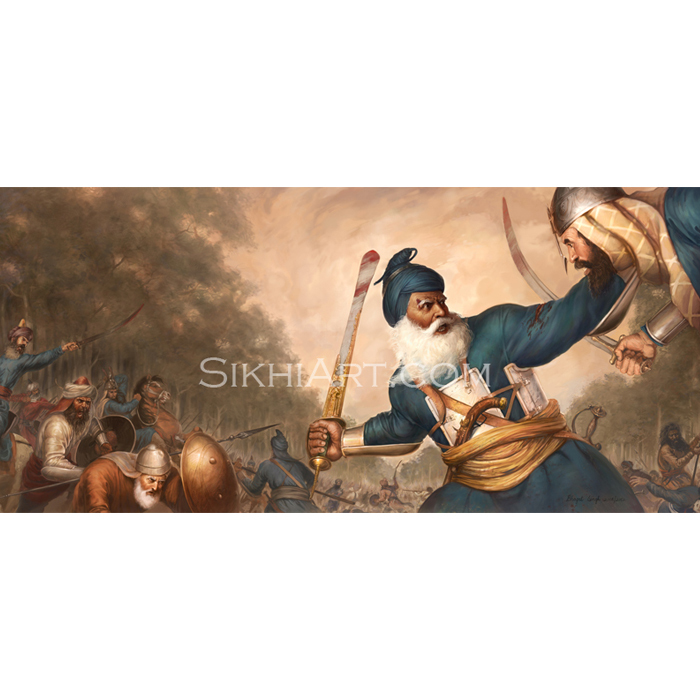 Parminder suggested that I should upload more paintings of Baba Deep Singh ji and Ranjit Singh ji. Um… like other from other artists because I have painted Baba Deep Singh ji already? 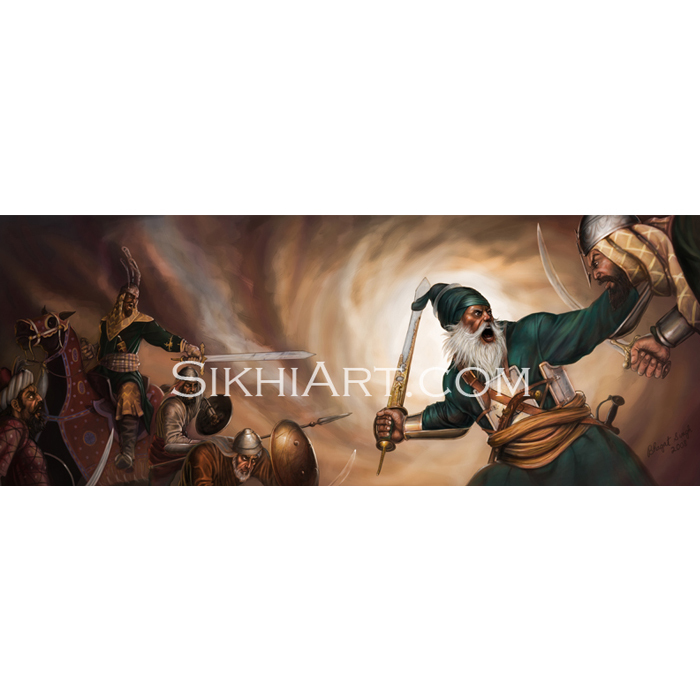 Here’s a youtube video featuring all of Baba Deep Singh ji’s paintings by various artists. There is one by Kirpal Singh (before battle, drawing a line with the khanda), one by Bodhraj (before battle, khanda lifted up), one by Sobha Singh (sitting posture) and one by yours truly (during battle). There are other paintings of Baba ji by artists unknown to me. There is a photograph of 3D statue representation of Kirpal Singh’s painting by another artist I do not know about. Pretty much all the paintings ever done on Baba Deep Singh ji are there. I don’t have a video like that displaying Maharaja Ranjit Singh’s paintings. 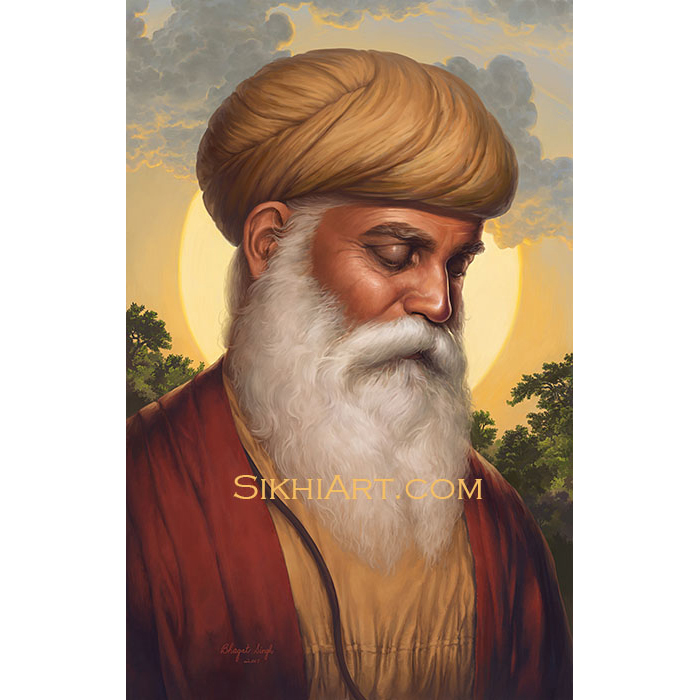 Can you please make one painting related to “sant sipahi”.I mean, picture in which sant character as well as sipahi character is also represented. Just click on “Purchase” here. Then when you have made your selections click on “*Contact the artist to place an order now.”. I truly appreciate your work, your patriotism and strong ethos reflects clearly in your art expression. I have visited the website on many occasions and am pleased to see your consistent commitment and hard efforts placed in each and every graphic. I have contemplated on contacting you before but have not done so thinking that the suggestion I am about to make is invalid. 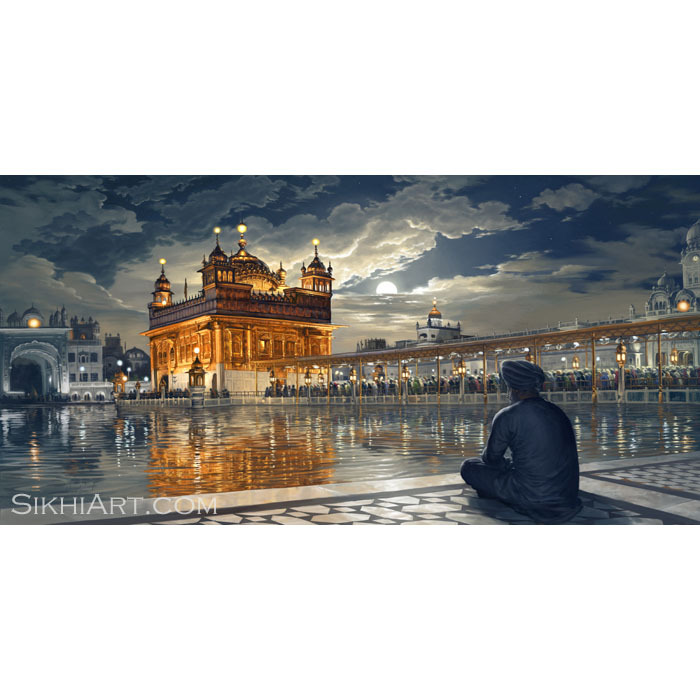 I highly respect the purpose of your digital paintings and how positively you represent the true nature of the Sikh warrior community and the Sikh community in general. I belong to the Rajput community and am highly proud of my culture and heritage; making a continual effort to not only preach the way of our ancestors but to also put it into practice. Your paintings closely represent the ‘Rajput way of living’ as many Sikhs are too Rajput. I make a strong and humble request to you to create some unique Rajput art pieces in your own traditional style that can appeal to Indian Rajputs and reinforce their deep roots, through depicting the bravery of warriors in battle. The Rajput community is in need of a modern touch to traditional ideas in order to stimulate positive reinforcement for younger generations, in a time where western influence is extremely high. I respect that this is not what you are used to doing i.e portraying Indian Rajputs but please assist me in the matter. Yuvraj, I have sent you an email. Do check. Thanks for the print. The detail is magnificent. Truly great work and very glad I stumbled across your website. nice work….i like guru govind singh ji… u are doing good but some cracter looking like muslim ..
dont mind……i think u take refrence sobha singh the great artist…. I like all of your painting. It seems real. I just have 1 question to ask that are you working on any other paintings. 2. On His Horse with sword drawn & His bow on His left shoulder & the Hawk on His Right. Also if possible, to increase your repetoire you can even make paintings of deities of the Hindu Pantheon like Ganesh, Lord Shiva, Shri Krishna & Shri Ram, etc…. if you happen to visit India, we can work out some arrangement to hold an exhibition of your paintings. You can get soft copies of your paintings & we can get them printed on canvas here itself…..
We can keep in touch…. 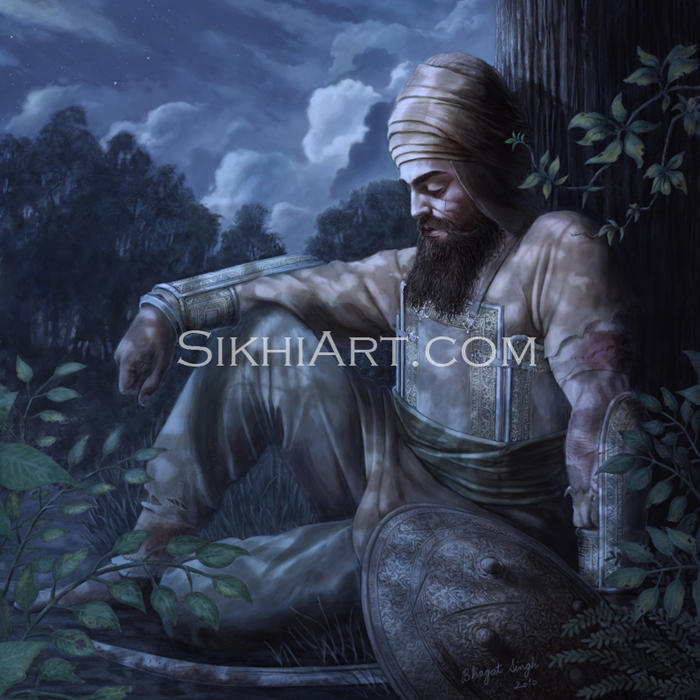 Guru Gobind Singh ji’s painting is meant to show a contemplative mood, not particularly happy but not so sad either. Suggestions 1 and 2 have been exhausted by Indian artists. In Punjab alone, there are so many paintings with the content you mentioned. And I am open to paintings of Hindu pantheon and even other eastern cultures, e.g. the Rajputs, Buddhists, Sufis, etc. These paintings will be painted as they come to me. 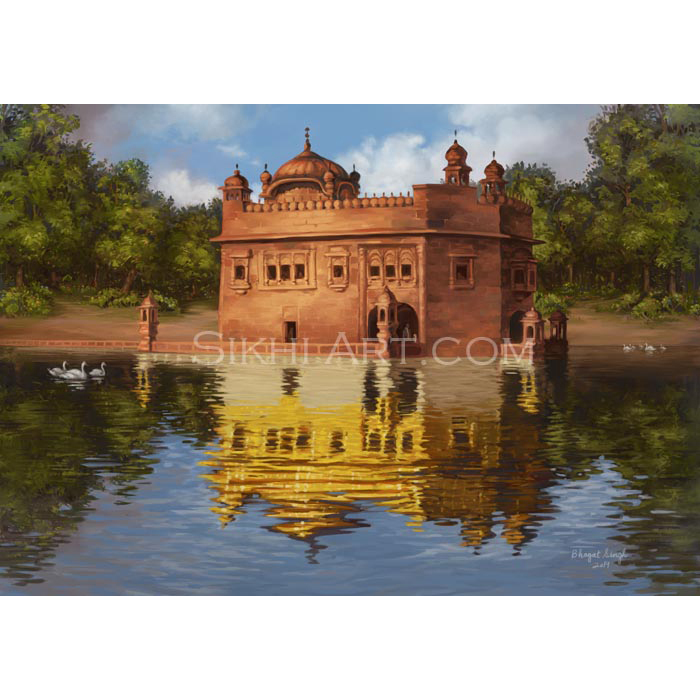 Bhagat veer, I just loved the Sahibzada Jhujar Singh’s painting. You should paint a Nihang who is giving out a ‘Jaikara’ on his horse and with raising his sword. APOLOGIES FOR MY FRACTURED ENGLISH. I appreciate that. Well here in Ontario, Canada we have art stores like Micheals or Curry’s. You can grab all sorts of art supplies there. Sat Sri Akal brother. I am so much inspired to see all your paintings, specially on warriors. You have great blessing of Guru’s, so you are presenting our religion and Martyars such a great and trendy way. As you know about The great warrior of the century Saint Jarnail Singh Khalsa Bhindrawale. There is no comparison of his sacrifice. But there is also one fake “TERRORIST IMAGE” runs parallel to his identity and makes few one’s double minded. So I request you to, please make such kind of painting of him which can represent his saint image with warrior dress up. For your knowledge/reference here is the link of katha about his spiritual life by his close friend Gaini Thakur Singh. I hope this katha can help you to understand about his spiritual life and you may will have an idea to make his painting. Sorry about any mistake and Thankyou very much. God bless you. I think your paintings are really great, and I do respect the intentionality given for the great sacrifices that were made during wars. But I do think it would be great if you could do some paintings with all the Guru’s sacrifices that were made without wars? I would really love to buy a painting that showed all the spirtual realms that our Great Gurus wanted us to learn including faith in GOD. I am very close to purchasing one of your paintings. But I would like to know, are the paintings which we purchase a digital copy of the original, or are we paying for the actual handmade painting? I sell prints of my handmade digital paintings on paper and canvas. I would be grateful if you told him that. Also tell him he is free to use any images as long as he mentions my name and website on the image. Hello, I love your paintings. I was wondering if you had any intention of painting Bhai Bidhi Chand Chhina? That is a print that I would love to purchase. Thanks. Yes. Do you want to commission it? Well, I’m a student from Vancouver. Commissioning a painting might be out of my price range. What would be a ballpark figure? Ahh…might be out of my price range by a lot. What about a student discount? Do you have any art of the Gurus in an act of humanity and nonviolence……Like giving water to his surviving enemies from battle? I have sent you an email. Check your inbox Ravi. Would love to work on it in the near future. If you wish to commission a custom piece, depicting your own vision, then let me know. Sat shri akal bhaji . Painting Sizes are in inches or cm ? Painting sizes are in inches. Hi, I want to know if you have earlier shipped to United Arab Emirates? Without any hassles? Yes, we do ship to United Arab Emirates, hassle-free.